I’m hoping that it’s just a passing phase. 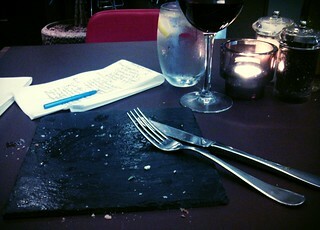 I find it quite difficult to eat off a slate tile without simultaneously decorating the table. This scribble was published on Thursday, February 14th, 2013. You can follow any banter on this scribble with the RSS 2.0 feed. You can share your inspired musings after typing the anti spam word near the bottom of the page. But no Pinging because its too naughty. Agreed. If they give you no plate, put yourself on red alert for pieces of hair. This is what the great Veg taught us. with this meal the sound of the flatware on the stone was icky. I love the chink of silver on china..